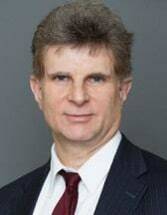 Roger Lavinsky, a senior associate of the firm, has been with Jaroslawicz & Jaros for twelve (12) years and has been practicing personal injury law for over 25 years, with a focus on construction accidents, products liability, elevator and escalator accidents, motor vehicle, premises and general negligence cases. Over his years of practice, Mr. Lavinsky has successfully resolved hundreds of cases and has secured numerous six and seven figure settlements for his clients. He has also successfully represented many clients involved in catastrophic injury cases, including a highway design case in the Court of Claims which resulted in a twelve (12) million dollar judgment against the State of New York. Mr. Lavinsky is a graduate, with honors, from the State University of New York at Binghamton and New York University School of Law. He is a member of the bar of the State of New York as well as the United States District Court for the Southern and Eastern Districts of New York.